Sore Wa Chiisana Hikari No Youna EOPN is provided for you and you can open it with EOP NMN Follow ME plugin to play Sore Wa Chiisana Hikari No Youna piano by following it. Enjoy Now! 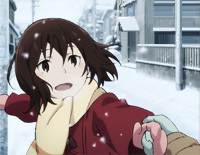 Sore Wa Chiisana Hikari No Youna is used as the ending theme of the a Japanese television anime, Boku dake ga Inai Machi Manga. Sore Wa Chiisana Hikari No Youna was sung by Sayuri.